« Solo – Get Ready for Another Double-header at HPT! The Kansas City Region’s RallyCross program began it’s second full season at a brand new venue, the Thunder Valley Sand Drags in Grain Valley, MO. Last season, the program held three events, two at Lenard Hollsworth’s property south of Garnett, KS and one at a site near Hillsdale Lake, KS. Both venues offered rather lengthy drives for many of the members in the Kansas City metro area. Thunder Valley is just a hop, skip, and a jump from our regular Solo venue and offers a much shorter drive for many of the competitors. Eighteen competitors and several spectators came out to enjoy the dirt and turf action. 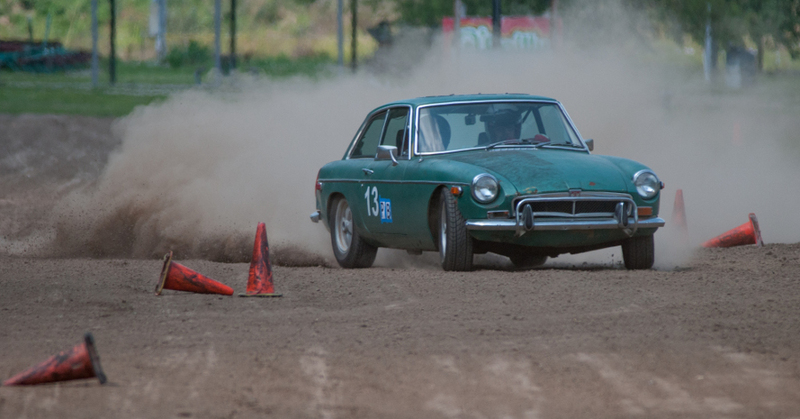 The smoothness and firmness of the surface at Thunder Valley was enough to entice some Solo drivers to bring out their autocross prepared cars, and they performed spectacularly. Kevin Brown even brought out his 1972 MGB-GT! 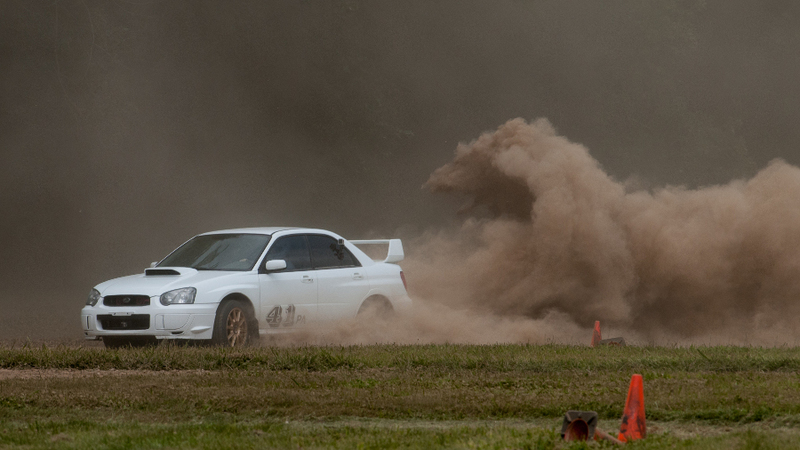 That’s proof that nearly any car can come out and play in the dirt with us. The site owner, Jeff Boles, has been exceptionally helpful and enthusiastic about our program and is working with our RallyCross Chair, Lawrence Duty, to make additional improvements to the site. Being our first event of the year, we didn’t have the logistics quite down and we were off to a late start, but once we got the show on the road, the action was fast and dusty! The two-wheel drive cars, both FWD and RWD, took to the course in Heat 1 with the exception of Jim Rowland, who made the trek all the way from Arkansas to join us, in his Prepared FWD class 1992 Nissan Sentra SE-R. Jim served as our second Safety Steward along with Doug Patterson who was also racing in the Prepared FWD class. The AWD cars and Jim’s PF car ran in Heat 2 with the benefit of a turf surface that was worn down by the Heat 1 competitors. Freshly mowed grass is slick stuff! After Heat 2, the competitors took an hour lunch break while the event officials got to work examining the condition of the surface and modifying the course as needed in preparation for the afternoon heats. The surface held up remarkably well! The dirt run-off lanes for the drag strip that we used are really hard-packed and proved to be extremely resistant to rutting. Even the turf areas were on solidly compacted ground and held up amazingly well. The dryness of the weeks prior to the event certainly helped, but with the turf areas being used for parking rather than agriculture, the constant pressure of vehicles over the years have compacted ground into an almost ideal RallyCross surface. With the afternoon course set, the competitors went at it again. There were a few good battles during the day and the afternoon competition became pretty intense. Jim Rowland showed what a National Champion rallycrosser could do, finishing second overall with total time of 291.191s which included five two-second cone penalties. 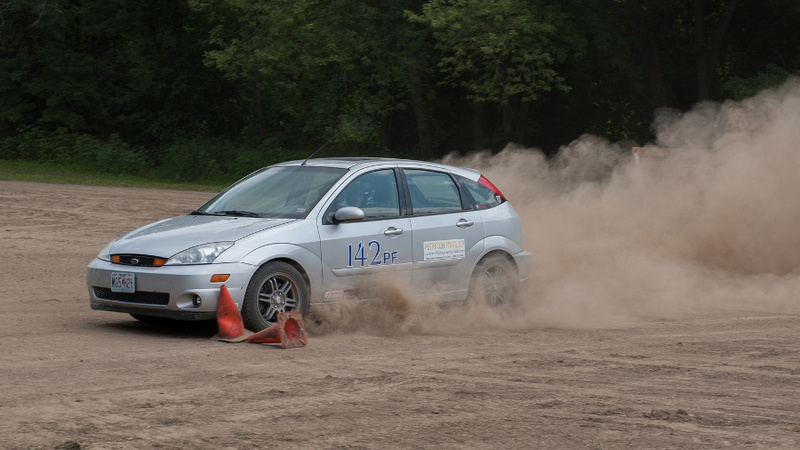 Jeremy Salenius and Doug Patterson duked it out for P2 in Prepared FWD, both driving Patterson’s 2004 Ford Focus SVT. Salenius stretched a nearly eight-second lead over Patterson in the morning session, but Patterson began chopping away at that gap during the afternoon session. In the end, Salenius would hold onto P2 in class by a mere 1.2 seconds over the eight runs. 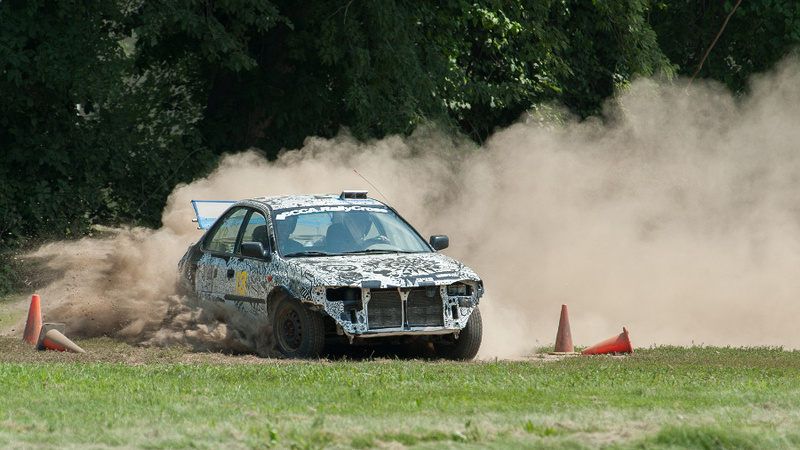 The Modified AWD class could have been renamed the Dirt Dog Cup as four drivers ran in Lawrence Duty’s what-used-to-be a 1993 Subaru Imprezza. There’s still about three-fourths of the body remaining. Rygh Galloway took the class win and third overall with a total time of 293.672 with no time penalties. Galloway was one of only four drivers to finish the day with no cone or gate penalties. Event Chair, RallyCross Chair, and Dirt Dog owner, Lawrence Duty, laid claim to P2 finishing 12.6 seconds adrift of Galloway. The fastest driver of the day was Mark Macoubrie took win the Prepared AWD class win and the overall victory in his 2005 Subaru WRX STi finishing the day with a 282.337 with only two two-second cone penalties. Macoubrie was 14.6 seconds clear of P2 in class Logan Howk who drove a 2000 Subaru Legacy GT. Photos from David Peterlin can be found here. In the end, our first event at Thunder Valley was a success. With the modifications Mr. Boles is making to the site, we will be able to utilize more of the available space and create longer courses. We will have at least two more events in Grain Valley and one at the Hollsworth Farm in Garnett after the hay has been harvested. Our next event is on Sunday, August 24th at Thunder Valley. Gates will open at 8:00am, walk-up registration will close at 11:00am, the drivers’ meeting will be at 11:30am, and the first car will be on course at 12:00pm. We anticipate eight runs for each competitor and we should be off-site by around 6:00pm. You can preregister at MotorsportReg.com and either pre-pay through MSR or bring a check or cash with you to the event. 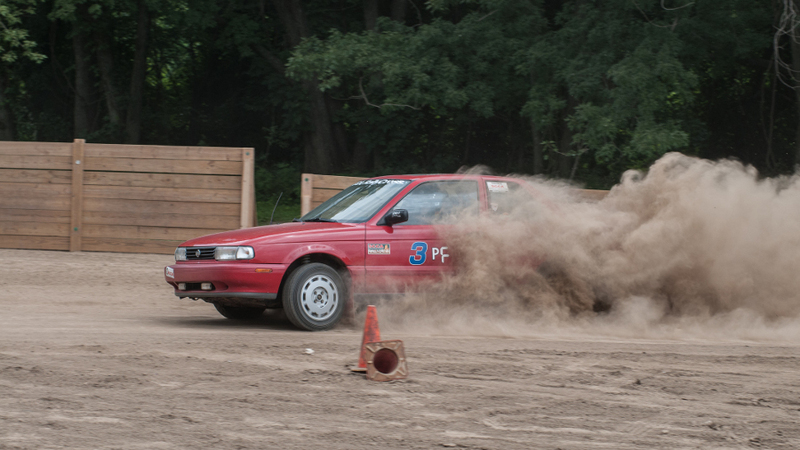 Entry fees are $30 for SCCA members and $40 for non-members. Any production-based car that doesn’t have a high center-of-gravity is welcome. Tagged Grain Valley, Rallycross, Thunder Valley. Bookmark the permalink.